Our minds are funny things aren't they? For many, things like names and dates, math equations and grammar rules never cease to not stick...but that song you haven't heard in years and years and years? You still know every word! Interesting isn't it? Our brains are better able to remember something set to music than just plain ol' facts. Just take a look at how we learn the alphabet for an example. Music is wonderful for ALL kids, but can be especially great for children like my son with autism and other developmental needs. Use Multisensory Interactivites for learning in variety of ways. Utilize variety of styles and instrumentation for student with learning disabilities and for traditional learners. They provide clear images of concepts. That we make available written lyrics to visually reinforce key points. That the songs ask questions in a way that helps the child gain confidence. Repeat or re-word concepts and issues. Frequently offer variety of examples from real-life situations. Use music to teach and reinforce important ideas. Have practice exercises available for lessons, in case the student has problems with cerain concepts. Provides and teaches memory associations (mnemonic strategies). Supports one modality of presentation by following it with instruction and then use another modality. Sings and speaks distinctly and at rates that a student with learning and processing difficulties can follow. Uses plenty of examples, musical and movement, in order to make topics more applicable. 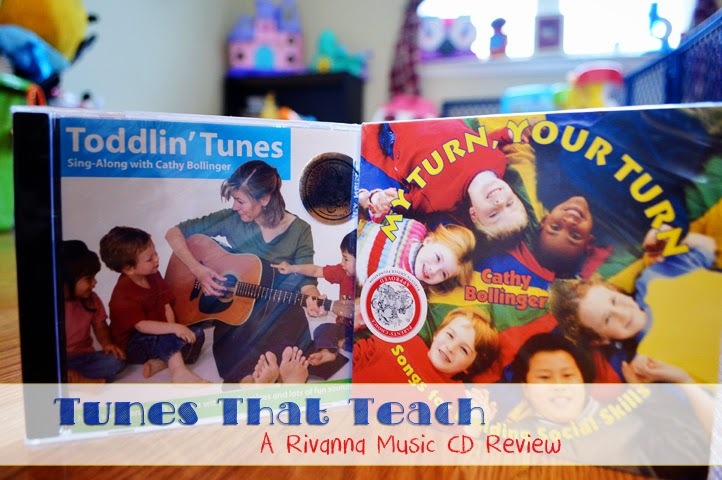 For this review, I received two of their fun CDs, 'Toddlin' Tunes' and 'My Turn, Your Turn'. First up, Toddlin' Tunes: A Singalong with Cathy Bollinger. I absolutely adored this! Have you ever noticed that in some children's CDs the singers are well...a little annoying? Absolutely not true here! Cathy's voice is absolutely beautiful. The songs may be for kids, but I still enjoyed listening myself. This CD featured some great classics as we all know and love them like The Muffin Man or Hickory Dickory Dock, along with some modified versions of the classics like Happy and You Know It. I particularly loved the adapted version of Patty Cake- already a favorite in our home, but made even more fun!! In addition to the classics were some great originals from Cathy. We pparticularlyloved Uh-Oh! There were so many great songs- from those that were fun for play to those that iincorporatedfun lessons like cleaning up, sharing and saying please and thank you. It was truly no wonder that it was named as a A 2005 Parents Choice Silver Award Winner! This is a great CD for every toddler! Next up, My Turn Your Turn...and I loved this one even more! Teaching a child with autism can be a little more complicated than teaching typically developing children. Skills that come naturally to most of us are a challenge. Skills like eye contact and making conversation are skills that naturally just come as we develop. For those with Autism, it's not quite that easy. Kids like my son actually have to be taught these skills through modelling and repetition. He had to be taught how he was expected to answer a simple question like, 'What color shirt are you wearing?' or 'Do you like pizza?' Even now at 7 years old, though he has come very far, Shaun struggles with these interactions. He often forgets that not everyone shares his interests or wants to hear about them nonstop. The songs on this CD perfectly address all of these issues. They serve as a reminder on how to respond to questions, to remember good eye contact, to have mutual two-sided conversations...and they do so beautifully. The songs are fun and catchy so I know my son will remember them easily too! He can and will still benefit from these even now, but I would have LOVED to have had the CD a few years ago too! There's now even an available companion book as well! Perhaps my absolute favorite song on the CD is 'Everyone Has Strengths To Be Proud Of'. More than anything, this is a lesson I have tried to teach Shaun. Though he struggles with communication and social skills, he has many great skills working in his favor. He has an incredible memory, is a great reader and is just amazing at science and math. I love that he has this little song to help remind him just how truly great he is and that he should always be proud of himself. If you have a little one with Autism, I HIGHLY recommend checking out Rivanna Music and seeing everything they have to offer. These are truly great songs that can make teaching our little ones these important social skills so much easier. And when you're raising a child with autism, anything that makes things a little bit easier is a great thing! And these aren't just great for home, but school too!! These are just two of the great albums available from Cathy Bollinger and Rivanna Music. You can see more fun selections and find useful resources at their website. Which CD from Rivanna Music would you love for the little one in your life? 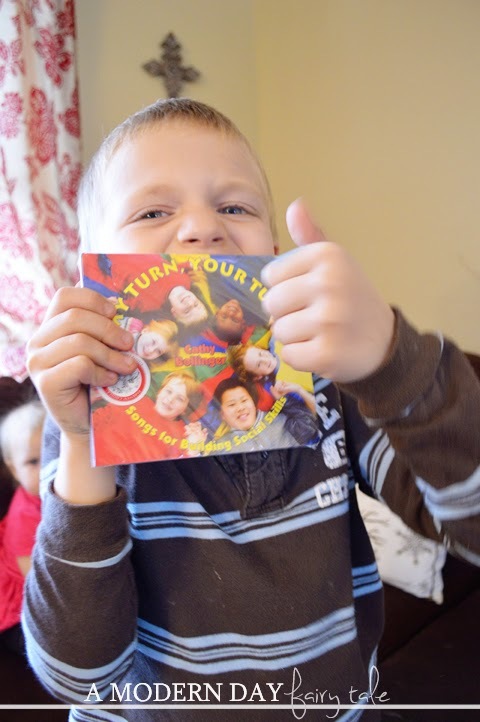 Thank you for your wonderful review of My Turn Your Turn and Toddlin' Tunes! We are glad you are enjoying them! !